I hate and I love. You ask me to explain, perhaps. I don’t know. But I feel it happen and the pain is dreadful. Often has leisure ruined great kings and fine cities. He seems to me to be like a god, even superior to the Gods, if it is permitted to say so, the man who sits gazing on you all day and listens to your sweet laughter. For there is nothing more ridiculous than a ridiculous laugh. You ask me, Lesbia, how many kisses it will take to make me fully satisfied? Let us live, my Lesbia, and let us love! Let us not give one penny if old men protest and disapprove. Who shall I give my nice new little book to, my little book polished with dry pumice? To you, Cornelius. Gaius Valerius Catullus was born in Verona, Italy. He was a Latin poet of the late Roman Republic who wrote in the neoteric style of poetry. His surviving works are still read widely, and continue to influence poetry and other forms of art. 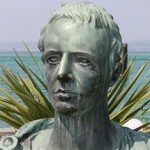 Catullus' poems were widely appreciated by other poets. His explicit writing style has shocked many readers. He wrote several books include: Carmina, Catullus: the poems, Writing passion, The complete poetry of Catullus, and Poems of love and hate.